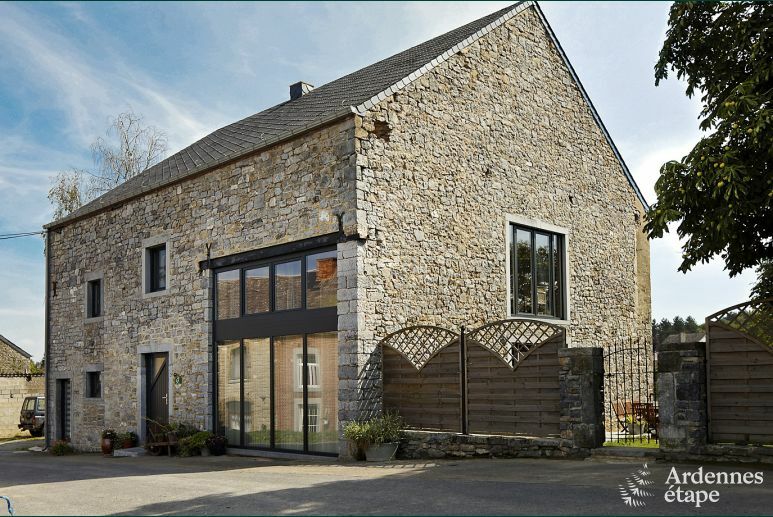 If you are looking for a calm and peaceful location in the Ardennes , this 3 star small farmhouse for 9 persons in Doische will delight you. You will be happy to find a neatly laid out holiday cottage in an idyllic setting. Enjoy a barbecue in summer ! An exciting activiy awaits you at the Vallée de la Molignée. You will enjoy a ride in a handcar on a former railway line through beautiful landscapes. If you are looking for a calm and peaceful location in the Ardennes, this 3 star small farmhouse for 9 persons in Doische will delight you. You will be happy to find a neatly laid out holiday cottage in an idyllic setting. Located in a calm and peaceful green setting, this holiday cottage is a true haven of peace. With 4 bedrooms and 3 bathrooms, this holiday cottage may host up to 9 persons with all the comfort necessary. You will spend much time in the vast and convivial living area. Just spend some family moments on the sofas or around the dining table. The holiday cottage also benefits from a functional and well-equipped kitchen that will satisfy the most demanding gourmets. And a charming outdoor space awaits you to enjoy the rural setting. The children will be happy to find a swing and a slide while the adults will enjoy a delicious barbecue. Whatever your age, everybody will find something to their liking. The region of Doische is full of activities to be discovered. The village of Treignes, for example, hosts many interesting museums. Do not miss the Chemin de Fer à Vapeur des 3 Vallées in Mariembourg and discover lovely landscapes. Not far away, the amateur drivers will be able to have fun in Karting des Fagnes on one of the longest karting track of Europe. For the thrill enthusiasts, head to Paintball Agimont Adventure for an exciting activity in the heart of castle ruins. Exceptional holidays await you in Doische. Book your self-catering accommodation now ! Treignes is a small village in the province of Namur, close to the French border. It has only around 700 inhabitants, but has four museums on its territory. It belongs to the municipality of Viroinval, in the valley of the river Viroin. Treignes is only 40 minutes away from Dinant, one of the most charming cities in the Belgian Ardennes, and Chimay, world famous for its delicious beers. Meet the railway track of the 3 Valleys, one of the most beautiful trails of Europe. Go back in time with an authentic steam train and cross the ‘Three Valleys' with their incredible landscapes. Karting des Fagnes has one of the longest tracks in Europe, more than a kilometre long (1366m), located in a lovely green area. On site there are also changing rooms with showers and a restaurant with a panoramic view. The Brasserie des Fagnes is worth a visit for three reasons. The museum show old machines and installations. The modern brewery produces the most delicious beers. And the tavern is the perfect spot to sit down for a drink or a snack, while kids have fun at the playground. Ideale woning om met 2 gezinnen een weekend door te brengen. Uitermate veel ruimte voor iedereen. Alles netjes verzorgd en een mooie ligging. Prachtig huis met een mooi uitzicht en gelegen in een prachtige omgeving. De eigenaren wonen tegenover het huis en zijn zeer vriendelijk. Alles is heel schoon en leuk ingericht. De vaatwasser en wasmachine zijn in de nabije toekomst wel toe aan vervanging en er is geen droger aanwezig. Verder een heel erg leuk verblijf gehad en wie weet komen we nog eens terug. Gîte superbement décoré, accueil très chaleureux. Mooi en netjes, gezellig ingericht, alle benodigdheden in de keuken aanwezig, hartelijke ontvangst. 1 minpuntje, het ontbreken van een haardvuur. Un séjour mémorable dans une maison qui a répondu en tous points à nos attentes. On s'y sentait comme chez nous. La propriétaire est adorable. Être accueilli un soir d'hiver dans une maison ouverte, chaleureusement éclairée et déjà chauffée à température idéale procure un sentiment de bien-être immédiat. C'est la deuxième fois que j'y viens, j'en ferais bien ma propre seconde résidence :o). Nous étions 7, et si nous le pouvions, nous donnerions une cote de 70/10! Merci! Zeer mooie en aangenaam ingerichte woning met alles erop en eraan (bvb. ruim voldoende servies en bestek). Zeer vriendelijke ontvangst. Absolute topper van een huis! Toplocatie, vriendelijke mensen, heel proper huis, van alles voorzien en goed hoog omheind. Ideaal voor mijn beagles. TV is nieuwer (met hdmi aansluiting) dan de beeldbuis op de foto. Als ik toch een minpuntje moet geven (om te muggenziften) dan is het dat de verdiepingsvloer niet geïsoleerd is waardoor je in de slaapkamers lawaai hoort van de living indien er nog mensen wakker blijven. Warme ontvangst. Alles is aanwezig in dit huisje. Veel oog voor detail, decoratie aangepast aan het seizoen (Pasen). De tuin is mooi onderhouden en ideaal vertoeven bij mooi weer. Rustig gelegen ideaal om te ontspannen.